Beans are the seeds of plants in the legume family, a group of plants known for producing seed-filled pods. These seeds will not only sprout new legume plants, but because they store energy for new plants, beans are also low in fat and a good source of protein and nutrients. Because of this, legumes are a staple of diets around the world. According to Ruth Matthews with the USDA, legumes are the basis of most foods in China and India. Beans have similar characteristics that can help you identify them. Look over your seed to spot basic characteristics of a bean. Most, but not all beans are kidney shaped. With a red, brown or white coating. Most beans have a tiny scar, which is called a hilum. The hilum is located where the bean attaches to the seed pod of the bean plant. Soak a bean in water for 48 hours. This will loosen the tough outer coating of the bean. Pry the bean apart with a knife. Beans are dicots, which means that their seeds have two pieces. This is the first sign that a seed is a bean seed. Look at each half of the bean under a magnifying glass. You will see a tiny plant embryo at one end of the inside of a bean. This baby plant is a shoot known as a plumula. The rest of the plant is a starch-filled endosperm. This endosperm is energy and food for the plumula, and it is the reason that beans are so nutritious to eat. If a bean is planted, the plumula will sprout as a baby bean plant and feed off of the endosperm until its roots emerge and it can feed itself from the soil. Determine what kind of bean you have by looking at the outer coating of the bean. The outer coating, along with the size and shape of the bean will tell you the identity of the bean. 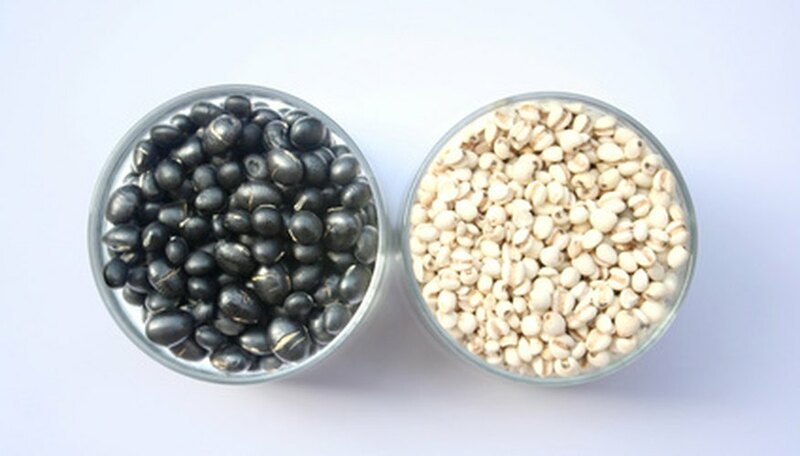 For example, pinto beans are brown with black spots, while black-eyed-peas are brown with a black spot or'‘eye' over their hilum.